Something strange is going on in Jerusalem's Lot ... but no one dares to talk about it. 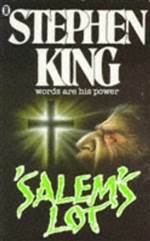 By day, 'Salem's Lot is a typical modest New England town; but when the sun goes down, evil roams the earth. The devilishly sweet insistent laughter of a child can be heard echoing through the fields, and the presence of silent looming spirits can be felt lurking right outside your window. Stephen King brings his gruesome imagination to life in this tale of spine tingling horror.